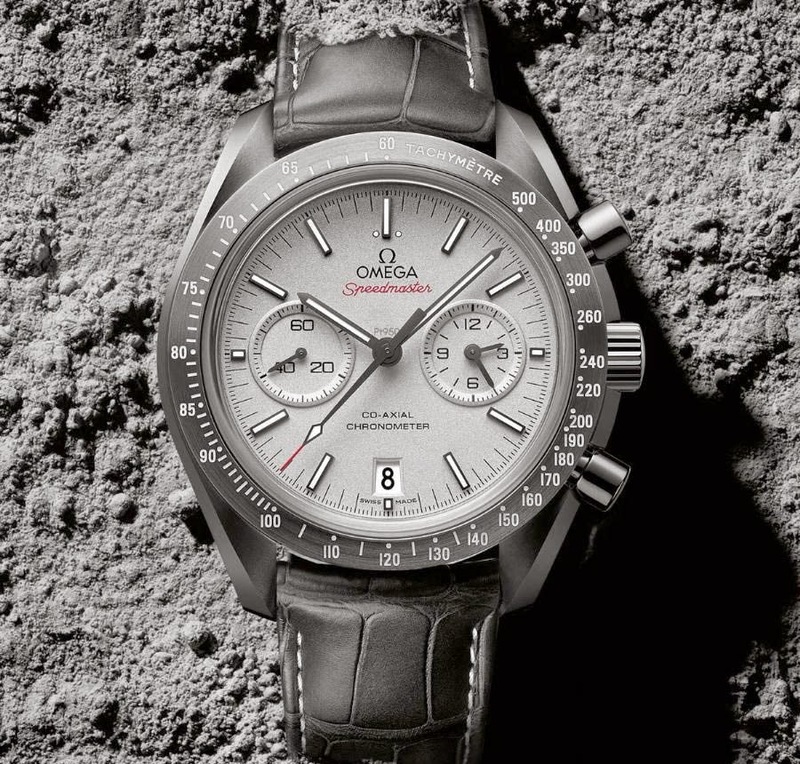 Omega has officially introduced to the public the Speedmaster "Grey Side of the Moon", which was first seen during BaselWorld 2014 with the nickname "Lunar Dust". 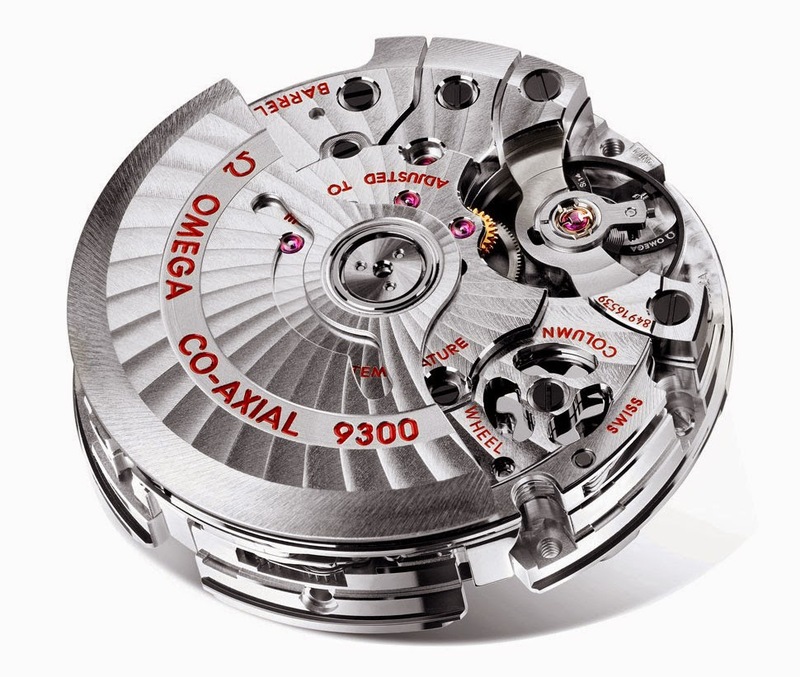 Housing the same in-house Co-Axial calibre 9300 used for the Speedmaster "Dark Side of the Moon" presented last year, the new Omega Speedmaster "Grey Side of the Moon" features a 44.2 mm grey ceramic case with sapphire crystals on both sides. Crown and push pieces are also made of ceramic. Originally white, the ceramic case of the "Grey Side of the Moon" takes its unique grey tone after a complex oxidation process. Thanks to the lightness of this exceptional material, the total weight of the watch is only 91 grams. The dial is sandblasted platinum, as remarked by the small Pt950 engraving above the central hands pinion, and features two integrated platinum sub-dials. The hands are black with luminous filling. 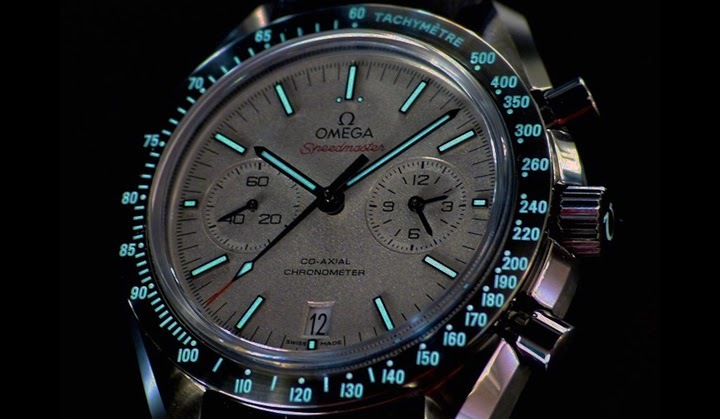 The tachymetric bezel is also filled with Super-LumiNova for legibility even in poor light conditions. The strap is grey leather strap with red stitching on the underside and a platinum buckle. 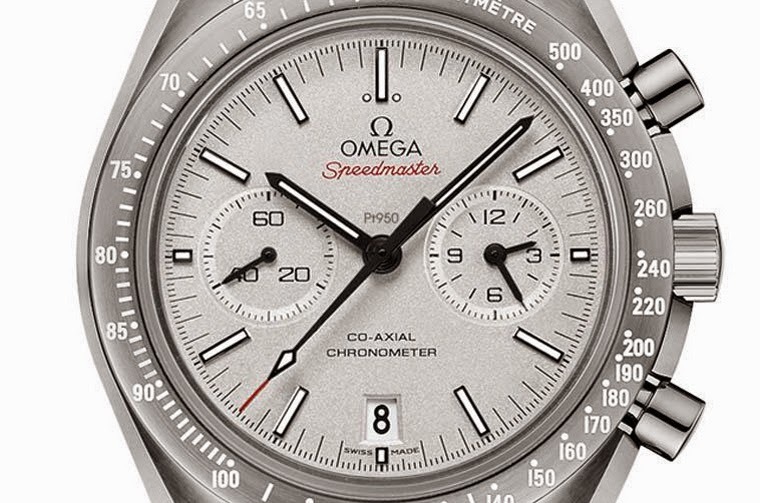 Available from February 2015, the Omega Speedmaster Grey Side of the Moon will have a retail price of Euro 9,800 / US$ 12,500. Mine has gained 30 seconds in 42 days. 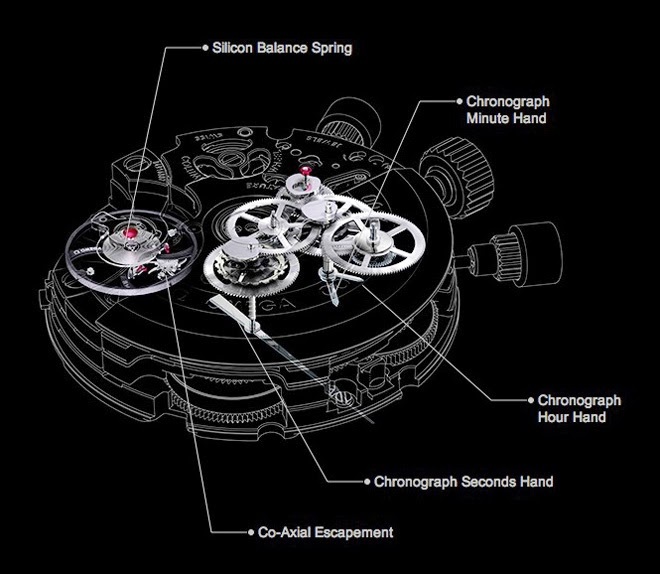 Unusual for a mechanical watch. 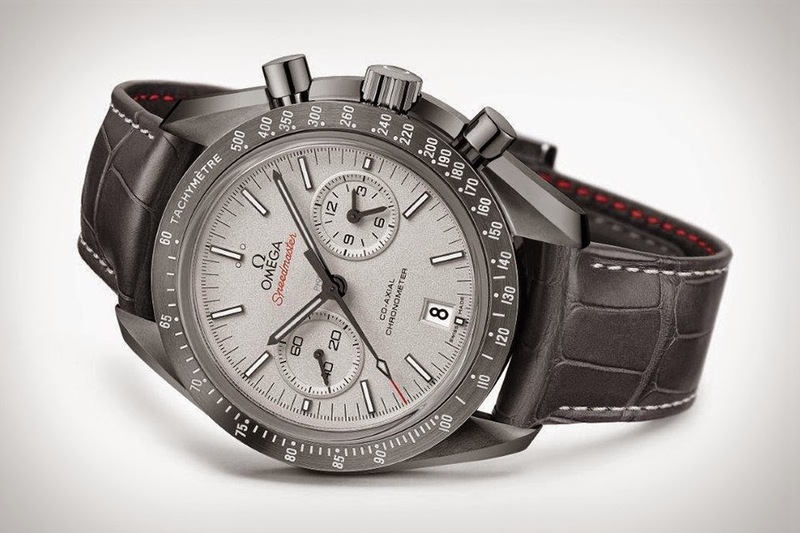 Time and Watches: Omega - Speedmaster "Grey Side of the Moon"
Omega has officially introduced to the public the Speedmaster‘Grey Side of the Moon’, which was first seen during BaselWorld 2014 with the nickname "Lunar Dust". The new Omega Speedmaster "Grey Side of the Moon" features a 44.2 mm grey ceramic case with sapphire crystals on both sides. Crown and push pieces are also made of ceramic. Available from February 2015, the Omega Speedmaster Grey Side of the Moon will have a retail price of Euro 9,800 / US$ 12,500.